Dogs are bundles of both cuteness and happiness; however, in this current day we live in, they are at an increased risk of developing skin problems if not treated carefully and immediately. And like many illnesses, whether be it dog or man, your best bet is first to identify if there is a problem or if there isn’t one in the first place. The skin problem we will be learning today is mange, and we will be introducing to you a checklist on how to tell if a dog has mange. What Is Mange and Is It Dangerous? 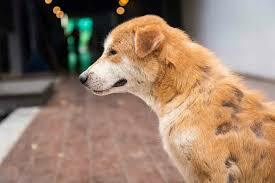 Mange is a common skin condition that is caused by naturally occurring mites found in your dog’s hair follicles. Mites by any means should not pose any danger to your dog as long as he is healthy and well cared for; there is nothing you will have to be wary about. However, problems do arise if your dog’s immune system is weakened, compromised, or deficient by any means because by then, your dog is not strong enough. When these mites grow in number and are preying on your dog’s weakened immune system, it can lead to some nasty skin conditions. There are specifically two certain mites to watch out for, and those are Demodex Canis and Sarcoptes Scabei. 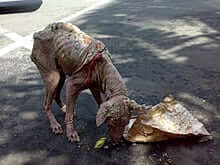 These cause Demodectic Mange and Sarcoptic Mange respectively. 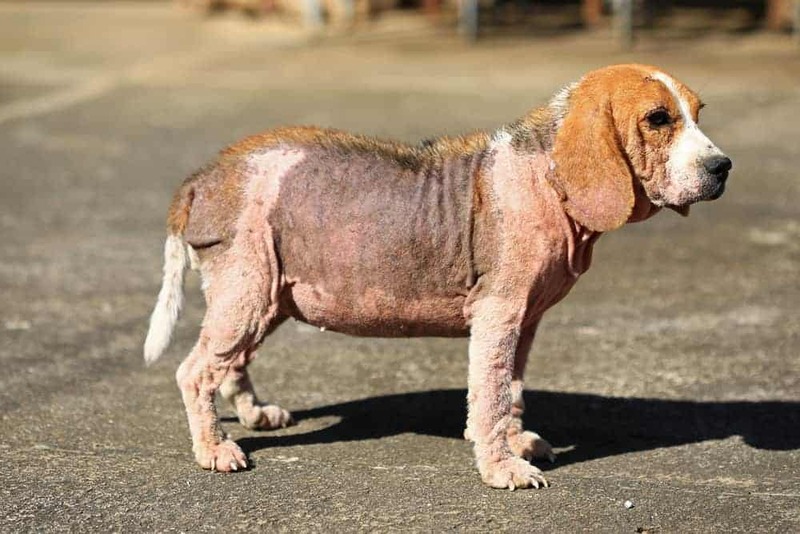 This type of mange is not contagious by any means, but a check-up with the veterinarian is still very important to find out whether what type and at what stage it currently is at. The condition can be classified as localized, generalized, and demodectic pododermatitis. Localized Demodectic Mange affects only a few parts of your dog’s body, and in most cases, this is the least dangerous to deal with as they mostly go away on their own. Generalized Demodectic Mange is the opposite of the first because this entails the entire body of your dog being affected by irritations, inflammation, and itchiness. Demodectic Pododermatitis is another area-specific type of mange that mainly attacks the foot region of your dog, and gets between the toes. Due to its hidden nature and constant brushing against one another, it can lead to wounds and bacterial infections, certainly the hardest to deal with among the three. This is a more dangerous variant of mange; this one is highly contagious and can infect many other animals in the environment, and cause slight red bumps to appear on people too. This is one of the more troublesome to deal with because it can also latch on to any of the areas of the home that it is capable of living in–making reinfection very possible. 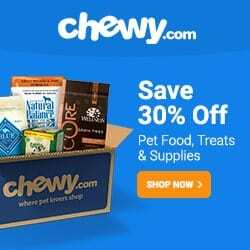 Related Topic: Fun Facts About Dogs: Why Do Dogs Try to Bury Their Food? One of the main signs that you will be quick to pick up on is the excessive itching that you may observe your dog has to deal with. The occasional itch is very normal for dogs, and to some degree, it can even be a pastime for them. However, when you start to notice that their itching levels go beyond what you’re used to seeing, then this means you might have a bigger problem on your hand. Fur gets everywhere, it gets on the couch, on your clothes, and you can’t go 2 seconds without spotting a strand lying around when you’re in the house. While this is completely normal to experience when you’ve got a pet around, it’s also something you need to watch out for. When the hair loss goes beyond the “normal” zone, and you start noticing some bald spots on your dog, then you might want to get that check out before it could lead to something much worse. Mange usually comes to dealing with a weakened immune system, and when your dog starts acting less happy and lively than it was before, then it could be more than just a bad day. Your dog could also work up a fever and lose the appetite to get the same amount of food he’s used to–all alarming signs that you need to be aware of. Another great cause for concern is when you start noticing redness or inflammation on your dog’s skin as this is a sign of a Sarcoptic Mange which could lead to additional infections of you and other animals in the vicinity. Check feet especially in between them in order to rule out the chances of your dog having Demodectic Pododermatitis. The sooner you have this checked, the better you will feel later on. If you start seeing red bumps on your skin and slight irritations, coupled with very weird signs and symptoms showing up on your dog similar to the checklist, then do act with haste. Head to the veterinarian and get it checked. 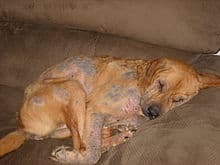 Mange is one dangerous skin condition for your pet, and learning how to tell if a dog has mange will surely go a long way towards making you and your pet’s life a whole late safer, and therefore, more fun. Just make sure to use this checklist and see if any of the signs and symptoms come back positive. And in the slightest chance that the evidence points to a positive, head to the veterinarian. It is best that you don’t take chances with risks like this and are better off finding out if it really is something to worry about or not! Previous articleFun Facts About Dogs: Why Do Dogs Try to Bury Their Food?